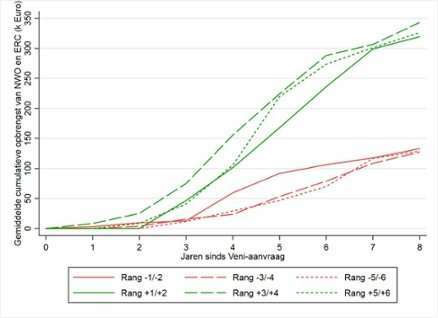 New research shows that winners of a large research grant programme in the Netherlands have a 2.5 times greater chance of obtaining a follow-up grant than nonwinners. The research, which focused on NWO Vidi Grants, was jointly carried out by sociologists from the University of Amsterdam, Utrecht University and the University of California, Berkeley. Why do scientists with similar backgrounds and abilities often end up achieving very different degrees of success? A classic explanation is that academic achievement exhibits a 'Matthew Effect', whereby early successes increase the chances of future success. But does a young researcher who wins a grant really have a greater chance of obtaining a follow-up grant than an equally talented fellow-researcher who fails to do so the first time around? To answer this question, the researchers investigated whether the Matthew Effect could be at play during the allocation of Vidi Grants, which are awarded by the Netherlands Organisation for Scientific Research (NWO). 'Candidates who were quite comparable at the time of applying for an early career Veni Grant had totally different chances of winning a mid-career Vidi Grant five years later', says Thijs Bol, associate professor of Sociology at the UvA. In their analysis, the researchers exploited the hard threshold in evaluation scores used by the NWO in deciding who to award a Veni Grant, which is meant for recent PhDs. Between 2002 and 2008, just over 4,000 proposals were submitted to the NWO. The assessment committee awarded a score to each proposal, after which a ranking was compiled. The researchers compared the candidates just above the funding threshold ('winners') with those just below the threshold ('near-winners'). In the years following a Veni application, the gap between the winners and near-winners continues to grow. After eight years, winners are two times more likely than near-winners to receive research funding from the NWO and its European equivalent, the European Research Council (ERC). But what can be done to narrow this growing gap? 'One can ask whether funding organisations worldwide should use earlier funding success as a merit criterion for assessing the quality of an applicant', says Bol. It could also be useful for funding agencies like the NWO to reach out to near-winners and encourage them to apply for a follow-up grant. Finally, one could question whether the distribution of smaller grants across more recipients might not be a more efficient method for providing academic opportunities to talented young researchers.